400-DST-L is rated 4.3 out of 5 by 109. Rated 2 out of 5 by Leoop from Disappointed Very disappointed with the usability of this faucet. The regulator handle is too sensitive to position. Every time the water is turned on we need to "hunt" for the right temperature position. It is very difficult to return to a previous setting since to turn off the flow, the handle must be pulled back and positioned in the exact center horizontally to avoid trickling flow and drips. From here, if you always want the coldest or hottest water ... no problem - just move the handle back and full left or right. If you're doing something like washing dishes and you want to return to the same warm temperature you've been using ... good luck! You'll need to estimate the previous angle to move the handle to and then once again adjust for the temperature. Our previous faucet that was replaced was a Moen ... much better. 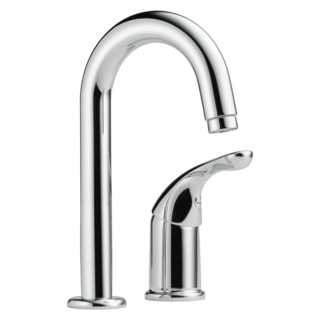 With that one, you could set the handle to the desired water temperature and turn on and off maintaining the same setting. 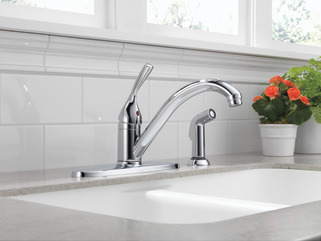 If we get frustrated enough, we may just replace this new Delta faucet. Rated 5 out of 5 by harpo from Easy to install I bought this a month ago and it was easy to install. It works great and I would recommend it. . Rated 5 out of 5 by Jack from ELegant and Simple My plumber recommended Delta products. I bought at Lowes and plumber installed as I watched. Very simple installation. 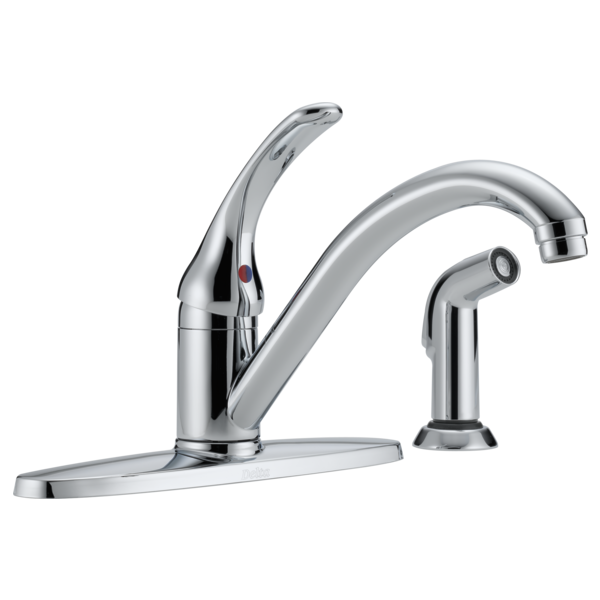 Chrome faucet and sprayer has great looks. I am very happy and I know it is guaranteed for life. Rated 5 out of 5 by MikeG from Simple but elegant design Should have replaced long before now. Beautiful, with smooth and positive operation. Rated 1 out of 5 by Big D from Sprayer head leaks Less than 2 months old and my sprayer is leaking from inside the spray head. Rated 5 out of 5 by Slim from Delta update Thanks to the fine folks at Delta and the speedy parts they sent I now have my Delta 400 DST working like new. The failure was in part to the well water we had it had very fine sand in the water and we changed to City Water. The faucet started to drip after we changed over. I feel the damage may have been caused before we changed to city water but Delta sent the repair parts and now we are happy Thanks th the great people at Delta. Rated 4 out of 5 by Bob R from Only 2 Months Old! So far it has been pretty good, but I am concerned because the spout is harder to swivel than a month ago. I hope it isn't going to start leaking like the old faucet did. Rated 5 out of 5 by Dee Day from Works perfect Very good quality for the price. installing a delta 400-dst-l , spray hose leaking , does not leak with the plug in the hose end end goes in and clip shuts tight. need a hint or two. 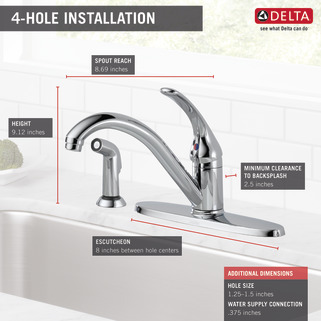 Is there a Delta replacement adapter (for the aerator) to connect the 400-DST-L kitchen faucet to a Sears/Kenmore portable dishwasher? This new Delta faucet leaks out of the top of the dishwasher connector (using our previous faucet aerator adapter). How long are the supply lines from sink top to end? I just recently replaced my kitchen faucet. I reinstalled another Delta faucet. The supply lines on the new faucet were about 2 ft or more in length. More than enough to reach the cut-off valves at the bottom of my kitchen sink cabinet. I must have an old model because those two copper tubes at the bottom have a flat end. Are they required to be soldered? Or, is there a way to connect them to the cold/hot water lines without soldering? Thanks a lot. You might need to upgrade the valves which the tubes attach to. A plumber can surely assist. 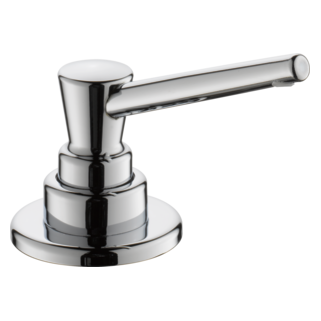 am installing faucet and wife wants to use a soap dispenser instead of sprayer. Do I need to do anything other than leave sprayer connection alone? Thank you for your question. 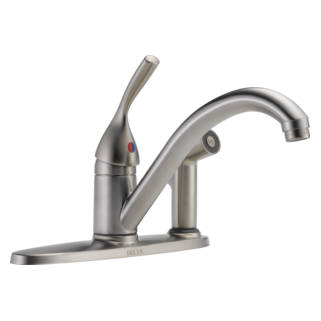 Delta Faucet model # 400-DST-L is equipped with a cap so that the consumer has a choice of using the sprayer or not using the sprayer. Just make sure the cap is in place before turning on the water.